I’m taking part in the 31 Days of ABCs series this month, and I’ve chosen the letter X. 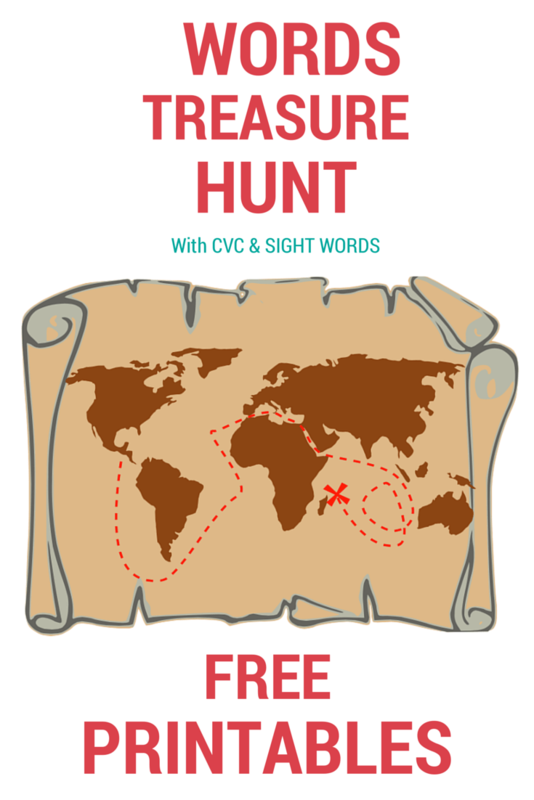 Since the boys are very interested in pirates I decided to go with an X Marks the Spot theme and have come up with these word and letter treasure hunt activities, focusing on the letter X. 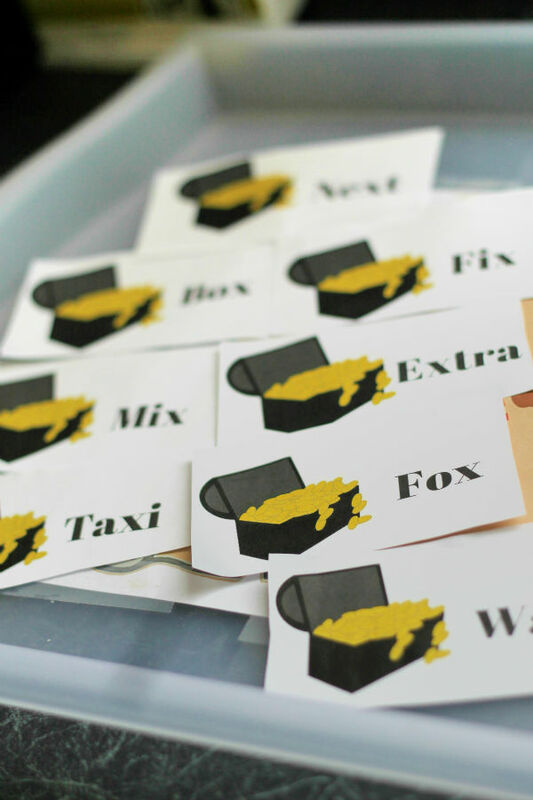 You can download your free printables at the end of this post to cut out and use for these activities, or adapt them for even more learning games. The first activity I had in mind was a sensory treasure hunt to offer some hands on learning fun. I taped the map background to the bottom of the tray (with a 100% clear tray you can tape it underneath if you prefer, since it will show through perfectly). 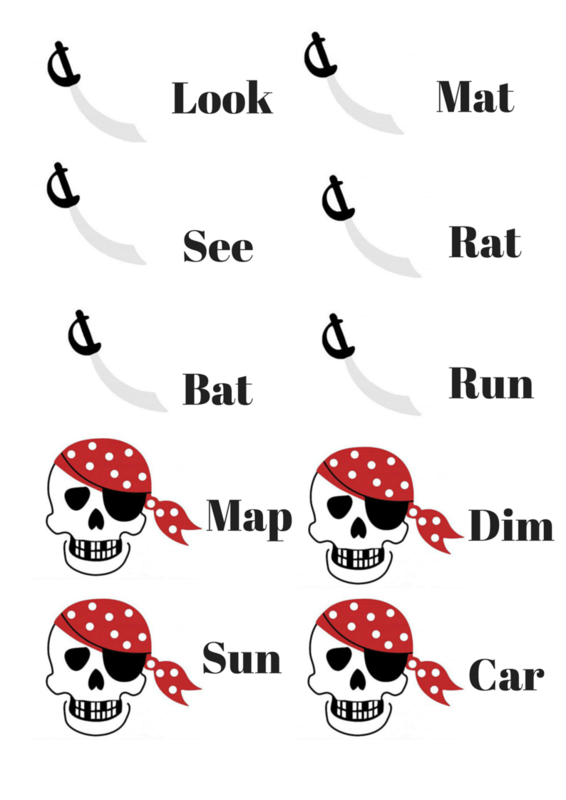 I added some of the word cards (see them all in the printable pdf file at the end) which the children would be hunting for. Then I filled the tray with some cloud dough (left over chocolate cloud dough in this case since that’s what we had to hand). 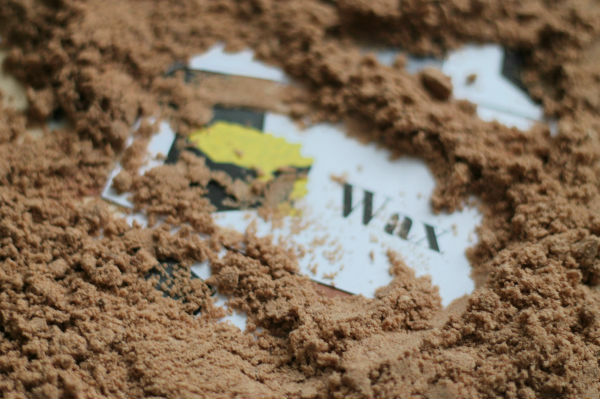 It has quite a sandy look and feel so it works well for the X marks the spot pirate theme. To stick with the theme I added some pirates gold coins, and had been meaning to add some old ‘pearls’ from broken jewellery but I forgot those at the last minute. Sea shells could also be a fun extra to include. The coins work great though since kids can dig those out as rewards for reading a word well or for spotting the letter X. Since I was short of time, I did not laminate these cards at all and they were fine. For long term use, it may be a good idea but cloud dough is not wet so the cards can handle being covered in it and buried underneath it with no damage. 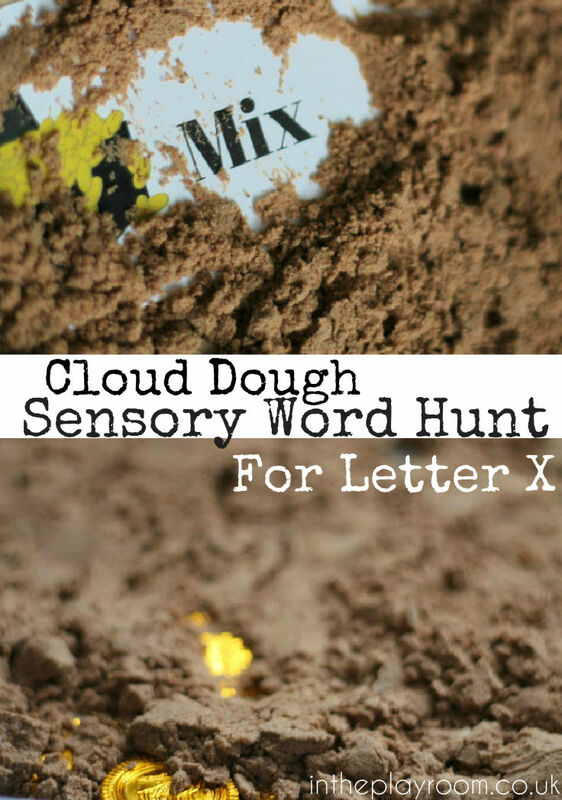 Since this treasure hunt is focusing on the letter X, I used the treasure chest design on those words which do feature a letter X just to help give a hint for my younger children, Mr T and Mr R. Those who can’t yet manage to sound out or read the words can still hunt for the letter X and recognise it within the words. For extra exploration of the letter X, I included a mirror in the tray too so that we could take a look at the shape and symmetry of the letter. 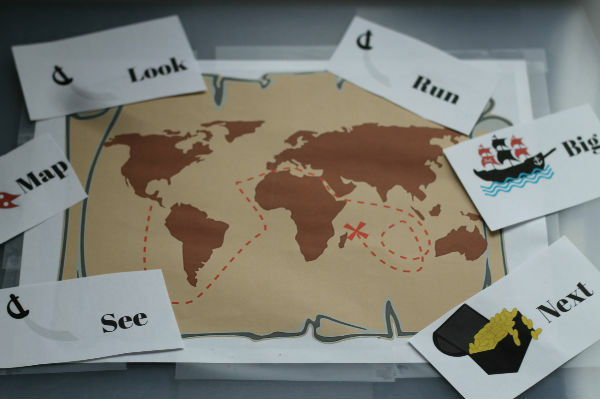 As well as using these word cards in the sensory treasure hunt, we played a couple of less messy letter and word games. One fun idea is to lay out several cards, only one with the letter X and see how quickly your child can find the letter X. If you want to make it more of a game they can each take a turn to do this, shout “x marks the spot” when they find their “X” and take a gold coin for each correct answer. 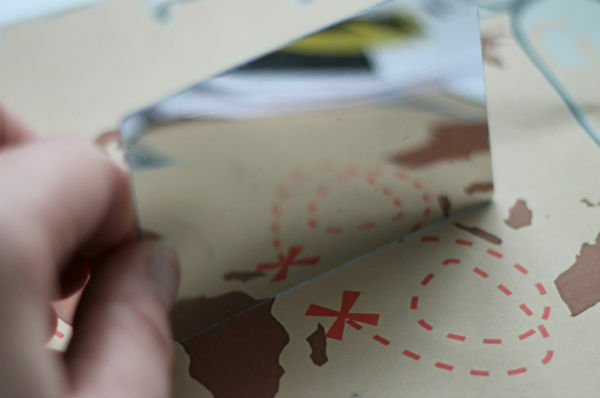 If you want to make it more challenging by removing the treasure chest “hint” then just chop the pictures off from the sheet. You can also just use the words for quick reading or spelling practise for older children. 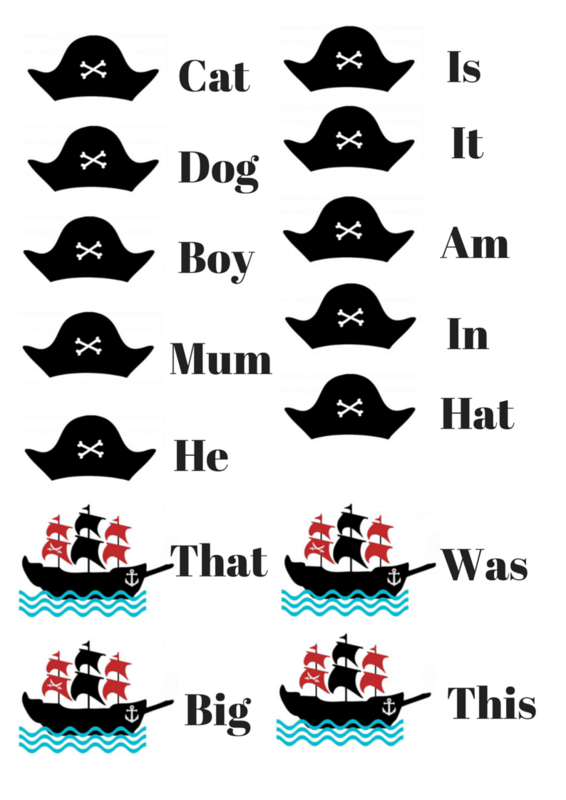 Mr Z is 6 and read all of the included words easily (I’ve chosen words aimed more at Mr T in reception class – simple CVC and sight words) but it never hurts to recap at any age! If you print off two copies of the word list, then you can also use the cards to play word snap – with double points if you get a word with the letter X! For these X words I have tried to focus more on words using X with the “ks” sound, as children will learn in phonics rather than X is for Xylophone, where X is pronounced as a Z and could be more confusing. 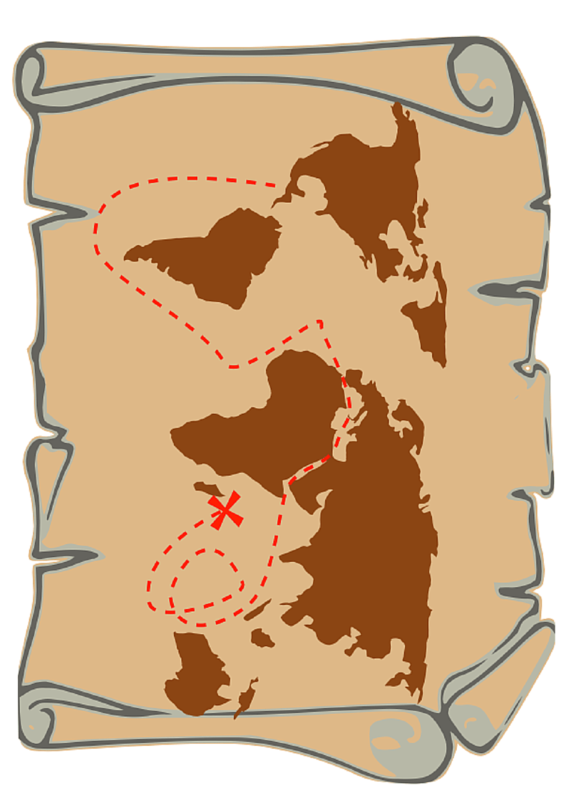 You can download a printable pdf file of all of the words and the treasure map background here. 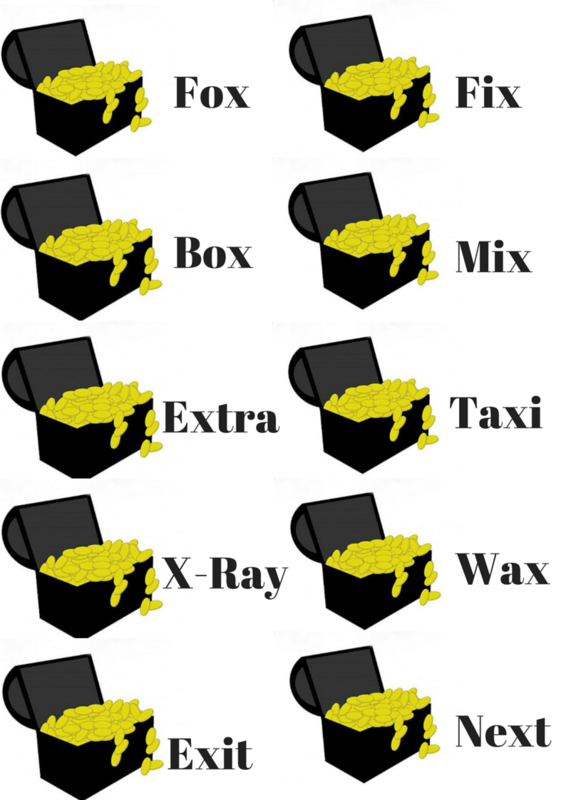 What a treasury chest of ideas! 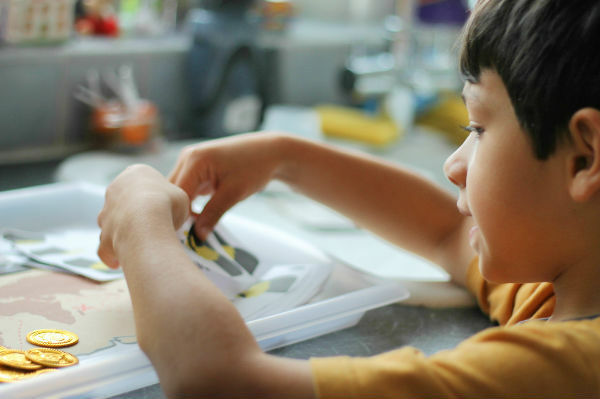 Thank you so much for sharing at Kids Learning Printables Linky Party!